Thanks to everyone who tried out Microsoft Forms by filling out our example survey. Here are the results. Our form was mainly an example of what’s possible in Microsoft Forms as part of Microsoft Forms – a quick look and sample We took the opportunity to get a better idea of what Office software our readers are using plus silly questions to show other question types. We’re taking all these results lightly. It’s a small sample size of a few hundred, self-selected respondents. Well over half our readers use Office 365 which isn’t a surprise given Microsoft relentless pushing of the annual payment option. Very few use Office 2019 which will also delight Microsoft because they really don’t want anyone to buy it. 17% of respondents are sticking with Office 2016 which suggests that people are staying with that single-payment version of Office instead of paying for Office 2019 or joining an Office 365 annual treadmill. 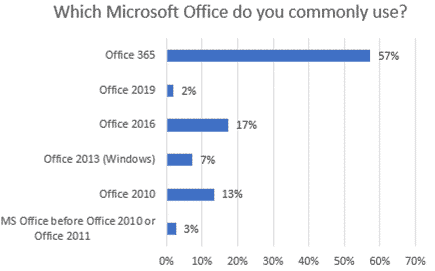 More people reported using Office 2010 than Office 2013 (13% vs 7%) which was a little surprising. Are they staying with Office 2010 for cost reasons or Windows compatibility? Overwhelmingly our readers use Windows 10. Again, that’s not a surprise since Microsoft has spent so much effort getting people to move, especially from Windows 8/8.1. A notable group using Windows 7 which is understandable. Microsoft loves to subtly denigrate people and organizations using older Windows but it’s a legitimate choice. The rest of our survey were examples showing the different types of questions available in Forms. Prefer their Lounge Room over a Dungeon. Think that children should be seen and heard. Do NOT want a pet dinosaur – by a 2:1 majority. If those results seem silly, they are no more stupid than some surveys we’ve seen in the regular media <g>.